-Helps reduce appearance of fine lines and wrinkles, resulting in noticeably younger looking eyes. Many people think under eye bags and circles are caused by being tired, but dermatologists and plastic surgeons agree that this is caused by capillaries that leak blood close the skin's surface resulting in the dark and bluish color. Finally, researchers have developed a product to combine a scientifically advanced proven compound to reduce those dark under-eye circles and puffiness and simultaneously reduce the appearance of fine lines and wrinkles, resulting in noticeably younger looking eyes: Revitol Eye Cream. Revitol Eye Cream was created by one of America's premier anti-aging skin care companies. They have succeeded at creating a powerful intensive eye cream that effectively combats not one but THREE of the most aggravating beauty problems...under eye dark circles, puffiness and wrinkles. Revitol's moisturizing emollients and natural ingredients help counter moisture loss and other characteristics of under-eye circles. Our soft, non-greasy formula absorbs quickly and leaves your skin feeling smooth and supple along with many other benefits. I can't tell you how often I'm told that I look tired because of the dark circles under my eyes. I guess some people don't realize how embarrassing this is. I have been plagued with dark circles and puffiness since my early 20s! But finally I don't have to worry about them anymore since I found Revitol Eye Treatment. Revitol's moisturizing emollients and natural ingredients help counter moisture loss and other characteristics of under-eye circles. Our soft, non-greasy formula absorbs quickly and leaves your skin feeling smooth and supple. Water, Caprylic/Capric Triglyceride, Glycerin, Silica, Hydrogenated Palm Kernel Glycerides, Hydrogenated Palm Glycerides, Cetearyl Alcohol, Cetyl Alcohol, Glyceryl Stearate, PEG-75 Stearate, Ceteth-20, Steareth-20, Butylene glycol, Niacinamide, Fraxinus excelsior bark extract, Silanetriol, Potassium citrate, Propylene Glycol, Dipelargonate, Dimethicone, Dehydroacetic Acid, Benzyl Alcohol, Chrysin, N-Hydroxysuccinimide, Palmitoyl Oligopeptide, Palmitoyl Tetrapeptide-7. Xanthan Gum, Carbomer, Bisabolol, Aloe Barbadensis Leaf Juice, Allantoin, Triethanolamine, Panthenol, Tocopheryl Acetate, Sodium Hyaluronate, Ascorbic Acid. Apply a small amount under & around the eye area in a circular motion. For best results apply to clean skin twice daily. "As a Medical Doctor with dark circles under my eyes since childhood, I was doubtful that your product would actually work. However, after only one monthy of usage I am certain that it has helped to reduce bags and lighten and tone the area under my eyes. It's a remarkable product." - E. Spektor, M.D. 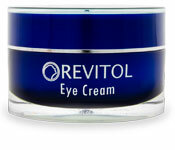 Product : Revitol Eye Cream. All Items are new set, and original imported from USA.